Positive discipline is just like any other skill. It needs to be taught with consistency! And you have come to the right place! This post offers a variety of ideas for establishing positive expectations. These ideas will set boundaries without hurting children’s feelings. The post is designed for both parents and teachers.You can use the information at home with your own child, in classrooms and in private music lessons. Each idea is followed by “short script” giving an example of the idea-again designed not for parents and teachers. If you are music teacher looking for step by step positive discipline approach in a music classroom see this article. Discipline is taught best as a part of the natural process of talking to a child. So all of the examples are “conversational”. This makes great toolbox to use at home every day. The idea is consistent interaction with a child while carefully guiding them to a better behavior. It is important for parents and teachers to set up expectations proactively. Teaching a child before they can do something wrong works both ways. It is more effective as the child is feels a positive interaction. It saves parents the trouble of going back an “undoing” a child’s action. The process becomes more of teaching and less of disciplining. In this case you would guide your child to the wanted behavior before an event happens. For example, before a party or a violin lesson, you would guide your child about what they should do. Focus on just one or two tips at a time. In a classroom situation, addressing your expectation at the very beginning of class is important. Pair that with statement of belief with the students capabilities and you can have a powerful combination. I know that at the birthday party we will have the best table manners. Do you want to know how? Today, we will talk about respect to your classmates. When a person plays and somebody else talks, this will hurt the person who is playing. We will practice being respectful during the solos today. 1. I feel that it is very important for us to have fun together AND to respect one another. This is why today we will be listening carefully as I am explaining the new skills. 2. I have a concern… yesterday during class I heard lots of students talking. Now, we will try to be quiet and listen more. 3. Today we will play some fun Twinkle games. However, our biggest goal is to try to be very quiet and listen to my instructions for the whole time. 4. (at home) Today we are going to a party. Our goal is to talk to as many people using the words “please” and “thank you”. The first thing if a child misbehaves is simply to make them conscious that their behavior is not acceptable. When doing that, it is best to use the “sandwich approach”. Let the student know what he/she is doing well, express your concern, and provide more encouragement. 1. You are doing very well with… However, I saw that you were interrupting class by talking over me. I know you will be better next week. 2. I am very proud of your playing! I can see that you are eager to learn and it will be easier to teach you if you don’t interrupt when I talk. This way you can really become a great player! 3. (at home) We had fun in soccer today. I saw that you were not very respectful to Mr…today. Let’s see what we need to do next time to improve. This is very powerful positive disipline technique that can lead to lasting changes in your child’s behavior. One of the best, and most subtle ways to improve discipline is by providing positive encouragement when you see good behavior happening. It works well with students who tend to get “defensive” or if a child is very sensitive to criticism. You need to “catch” a behavior that you want, and encourage the student to repeat it by congratulating them. Read a more detailed posts in this article for parents and this article with step by step positive discipline tips written for teachers. I saw that this last time we played the piece, you were focused on the music very well! That was excellent! Let’s se if you can do it on the next piece! We had an excellent class today! I was so proud to see that you waited till the end to raise your hands and ask me questions! I was looking at John while we were playing, he was watching me carefully and did not turn around/talk for the whole time! Everybody did wonderful playing Twinkle. I would especially like to congratulate Ema for watching my bow all the time. Let’s see if we can do it one more time with everybody watching my bow! After class: I was watching you today. I saw that you were very quiet and then you helped putting chairs back. Thank you! This is similar to the first approach. Addressing your expectation is also effective when students see their behavior in a way that affects their friends. If a child is being very disruptive and crossing boundaries, or after you have tried all the above and the child is still misbehaving…notice that I am putting this last..after I have tried the other options. I feel that you are not ready to be in the class. Please, sit with the audience, and when you are ready we will invite you back. I feel that you are not ready to go to the park today. We will go when you are calmer. I hope this post helps with some ideas about interacting with your students or children. I will be interested to know which ones of the positive discipline tips are working for you. If you have any specific thoughts, scenarios or concerns, please let me know. I will be interested in hearing about them! Love your statement of feelings. I'm a big fan of the "sandwich" news giving. Great post! I love this! I especially like how you gave examples of what you were talking about with each. I'm a FTM and I plan to homeschool so this is helpful. Thank you, Brittnei, I am glad the article was helpful. I own my own business but also teach part-time so I am familiar with some of the teaching ideas you had. What I love is that you found ways to use those same wordings and strategies at home with our own kids. Excellent and so helpful! I wholeheartedily agree with your ideas. Funny thing is some of this even applies to training our rescue dog! Thanks for linking up this week at My Favorite Posts Show Off Weekend Party. Hope to see you again soon! Thanks for linking up with the Blog Hop Blitz! You really know what you're talking about here. This would be a very beneficial post to new parents. Cheryl, Betty and Michelle, thank you for your comments. Yes, I am trying to transfer what I have learned from working with kids and help parents with their children at home. Thank you for your feedback! So many great tips, and it's fantastic that you shared them. Thank you for linking to Super Sunday Sync. I loved this post! These techniques can be used in the classroom and in the home–good for you! Thanks for linking up to the Hump Day Blog Hop this week. This is wonderful! I have been having some struggles getting my lovely lil miss to focus during her school work. Most subjects she zips right through with very little effort, however math I have difficulty getting her to focus on the work at all. I am going to definitely be giving these a try! Thank you so much for linking up at the Show Off Weekend Blog Party! Have a great week! Thank you Stacey. I would love to hear back how the tips have worked at home. I am also writing a post right now about baking games and MATH so stay tuned! Thanks for sharing! These are great tips, and they work. 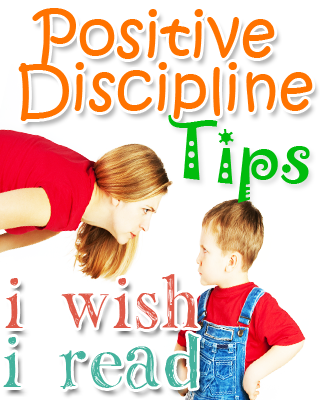 We discovered Positive Discipline when our oldest was around five years old. What a remarkable difference it made in our relationship and her behavior! The phrase we would use was "I see you have chosen x (not stay in your pajamas, to be loud, to hit, etc). Then we would let the girls know the consequences of their behavior, which we had talked about previously, so there was no surprise there. The one thing I would caution is to stick to your plan when you start implementing this. Children will test you to see if you mean business! This is such a wonderful comment thank you for adding to the discussion! Yes, I absolutely agree that children will test us to see if we mean business. With that consistency is key. If you don't provide consistency with the way you talk to a child, they simply won't learn! I see this all the time with my students at all different ages. They try to push the boundaries bit by bit and they want to see how much I would give in. Once I've learned about it, it is actually very curious and insightful process to observe! Thanks so much for sharing all these great ideas!! This is great. Thank you for posting this. It's informative and really helps for those of us with kids. I think positive discipline is so great! I'm working on it with my kids. I also need to finish reading a book about it that my mother-in-law let me borrow. I'm featuring this at my link party tonight and pinning! Thank you so much, Alexis! I appreciate it! Great tips and very useful for the parent at home. I love the sandwich idea. My son is very sensitive and I think that would be helpful. Thank you for this great post. My children are all grown up but my daughter along with my 18 month old grand daughter lives at my house. I am able to play a part in disciplinary aspects of her life. Stopping by from SITS! Enjoy your day being featured. Blessings! I love your idea about developing character through stating your expectations. I've never thought about teaching character through that simple way! Great examples for sandwich approach. Sometimes, I really get stuck using that one, thinking that I need to say two good things the child is doing. Next time, I will make a positive statement about what can happen in the future. Thanks for the ideas! Great info! Happy SITS day! These are fantastic tips! Thanks so much for sharing! Victoria:What I found very useful on this alctire is that they advice to set rules for the kids, Ib4ve seen many cases in which parents spoil their kids as a way to make up for the divorce, and they keep doing it for years. This only makes things worse, for both parents and kids. Having rules and following schedules make kids more secure and also feeling better in the environment they live, even if it went through some changes. I do like these suggestions, a lot. As a parent and an educator I value and practice Positive Discipline within our home and classroom. There were two things that stood out to me, though. The two graphics don’t necessarily look Positive Discipline, really not photos depicting a conversation . And the use of “time-out” that really isn’t a part of PD culture. I understood what your point was; I just wonder if there is another word that could be used? We use “cool-off, ” “brain breaks, ” “belly breaths.” I hope my feedback is helful.